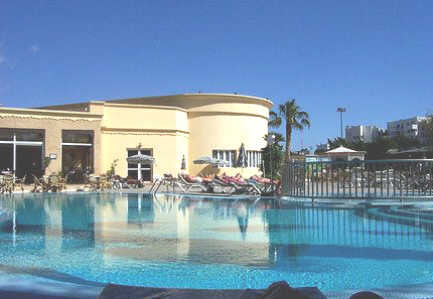 We were so impressed with our holiday in Agadir in 2005 that we decided to return a couple of years later. Only three and a half hours flight away and in the same time zone, one can expect many days of sunshine with temperatures between 14 and 30C but with a cool Atlantic breeze even on the hottest of days. Virtually no humidity and no insect pests, at least in developed town such as Agadir. This year we didn't have any 'jabs' as we didn't expect to be 'up country'. We have never had any tummy upsets despite eating a wide variety of foods including delicious salads every day. This year we opted for an all-in holiday and were rarely tempted to eat out as the hotel food was really first class. Alcohol was freely available and even imported spirits were included in the deal. No sooner had we finished breakfast than coffee and pancakes were served at the pool bar, followed by the mid-day barbeque. I take credit for the fact that I did not put on a single pound ! Apart from some changes in photographs this page is very similar to last year. Agadir is on the long coast of Morocco, about half way down. The most westerly part of Africa. Its situation and climate seems similar to that of California, with a prodigious amount of sunshine but with cool sea breezes resulting in temperatures rarely reaching the nineties (f) even in midsummer. As ideal a climate as one could wish for. Like California it is backed by mountains, so water is no great problem on the coastal side, there being large reservoirs in the north. 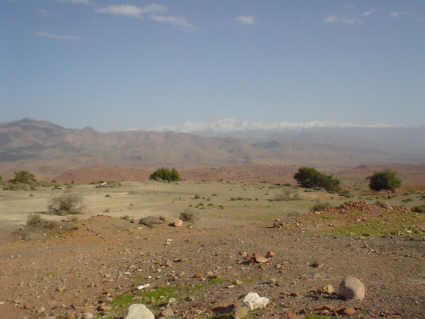 On the other side of the mountains and to the south there is desert, only inhabited by Berber nomads. Also, like California it is subject to the (very) occasional earthquake. The city suffered a disastrous one in 1960, which virtually destroyed all the buildings and killed 15,000 people. So, all the buildings are new and one has to go further inland to find anything of historical value. 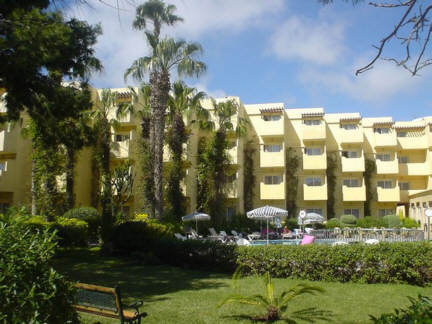 The hotels are first class with extensive grounds and large and interesting swimming pools Despite the fact that the hotels are modern, the tradition of tiling and carving everything prevails in public buildings and larger hotels. 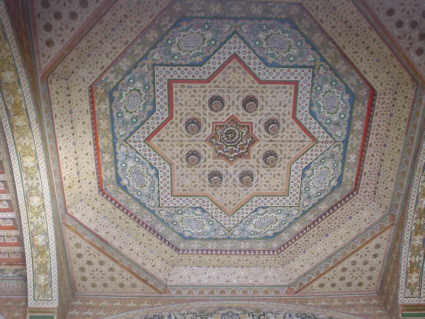 Everywhere one finds the intricate designs which have been handed down over generations. It seems against their nature for them to use prefabricated materials for finishing the inevitable concrete underneath. 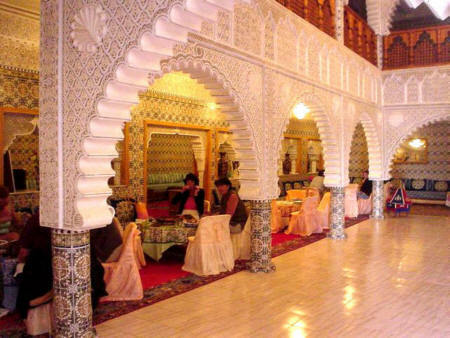 So even a three star hotel will have painstakingly carved wood and stone panels, tiled or marble floors and elaborately mosaiced walls. The designs even extend to the pillars and ceilings, which are richly carved and painted. This palatial place was where we stopped off for a meal during a 4 x 4 'off road' tour. 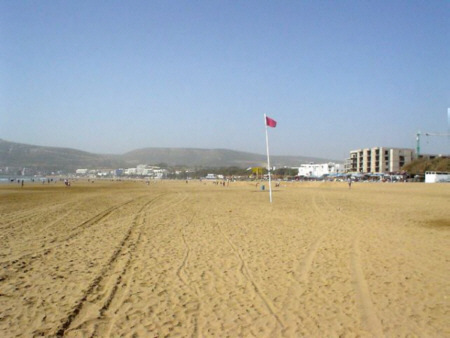 Agadir has a splendid beach which extends for miles from the port, along the promenade and far south, where the newest and most splendid hotels are situated with ready access to it. Sometimes there is a haze in the evenings, a bit like San Francisco. The sea is the cool Atlantic and the breezes make it ideal for surfing, though a wetsuit might be a good idea. Beach sellers are few and not bothersome, usually taking ‘no’ for an answer. All the sea shore, which is mechanically cleaned daily, is accessible to everyone, though most hotels have a private area at the back of the beach with a restaurant and sun loungers. Soft drinks (e. g. Sprite) were reasonable at around 12Dh (72p) (30p for a large bottle in a supermarket) The local beer (Flag) was around 18Dh (£1.08) Nescafe was 8 – 12 Dh. Freshly crushed orange juice is served everywhere and is inexpensive. Begging seemed non existent in the town, except in the large old Souk (Al Had). 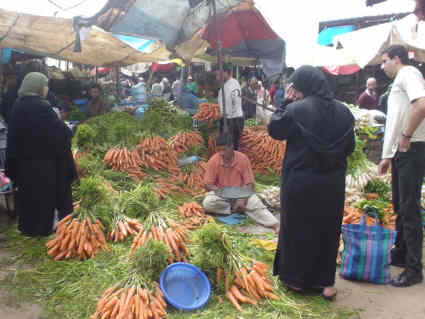 The souks are vast covered markets (usually surrounded by massive fort like walls) Most things can be bought there. 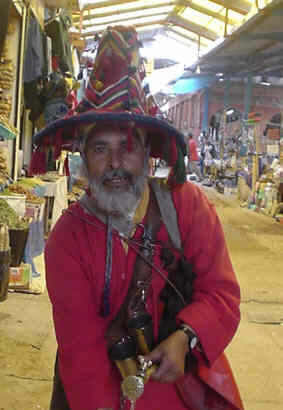 Buying gifts in the souk reminded me of ‘The Life of Brian’, where he wants to buy a disguise in a hurry but where the haggling is considered an essential. “Come and sit down and let’s talk about it. How about some mint tea?”. It is possible in town to go to shops with Prix fixe signs but even there haggling is possible. Signs are usually in French, which is most Moroccan’s second language and a smattering of it is useful. 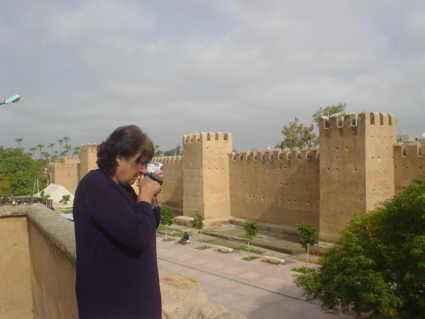 To see real Moroccan towns we visited Touradant (2005) and Tiznit (2006) not far inland from Agadir. Touradant is was a very old town with a magnificent ancient wall. Again the souk bustles with activity and the men sit around under the olive trees in the square for hours (whilst the women do the shopping) Tiznit is famous for its silver filigree jewellery. Very intricate and all hand made and the artistic creation of each craftsman. New blocks of flats are set well back from the road leaving a wide area each side of the road to the airport. The road as far as the airport is two lane and bordered with palm trees (by order of the new king). There is a tremendous amount of building going on with new residential road systems being laid out and huge plastic drainage and water pipes everywhere. Here and there near Agadir there are shanty villages where people who can’t afford to buy or rent flats live. Estate agents windows indicated that flats cost around £40,000, which must be beyond the reach of many. Fifty percent of the rural population is illiterate and many are too far away from schools to attend, spending their time working in the fields or as shepherds, where the average wage is as low as £4 a day. Even the hotel workers are paid only around £7 a day, so tipping is expected everywhere (but I never saw a scowl if you didn't have any change!) It is as well to get some small change early on in the holiday. Currency cannot be bought before arrival and has to be changed back to sterling on leaving. Most of the land we saw was as flat as the Fens but with some hilly areas nearer Marrakech and at times one could see snow on the distant Atlas Mountains. The soil looked sandy and infertile and covered in rocks, like Mars, but with many hardy trees. But here and there irrigation resulted in a green field or orange orchard. Near Agadir there were numerous low plastic greenhouses, used in the production of vegetables. 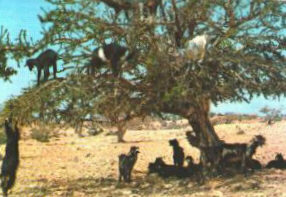 In some areas, where grazing is scarce the goats are said to climb trees. I have never actually seen this but I don't think it is just a fable ! The journey from Agadir on the coast to Marrakech takes four hours. The road is quite good and being widened and improved all the time. No visit to Morocco is complete without a trip to Marrakech, favoured by the famous from Churchill, the Beatles to Rita Hayworth. 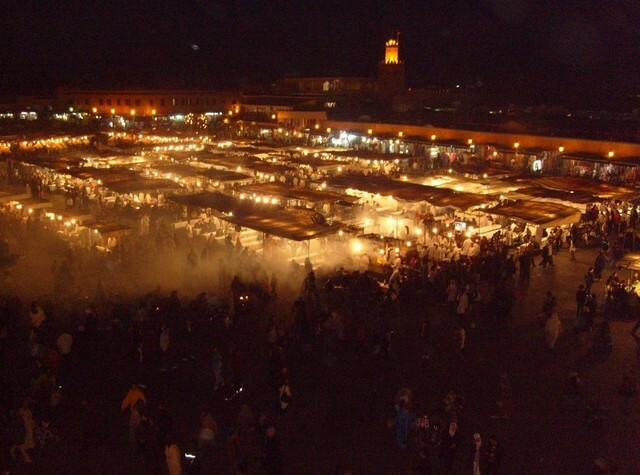 Marrakech is, well…. 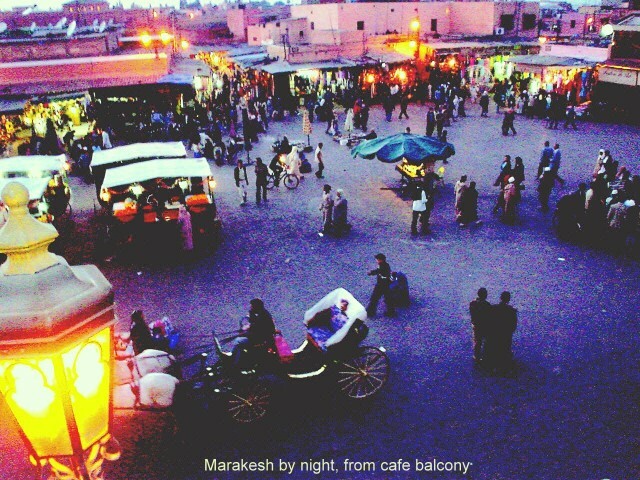 Marrakech, although it seems to have lost the druggy image it had when it was the haunt of the Beatles and the Stones. 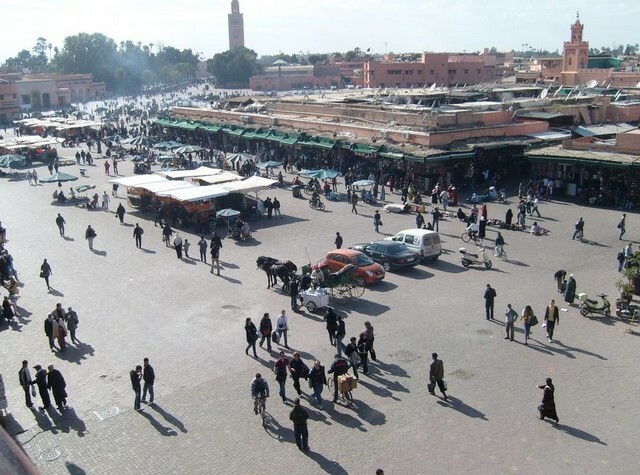 It is a town full of tourists and locals concentrating on the famous Djemaa El-Fna Square, which adjoins a massive Souk/market. This is mostly covered and extends into the surrounding residential area (Medina), with craft workshops producing the goods such as the hand made leather, carpets, metal, ceramics and jewellery which sell in the market. There are no rules in the narrow streets, where cars, donkey carts, mopeds and horse drawn carriages mingle with the crowds of shoppers. One presses against the walls to let them through but I never saw anyone with road rage or even a near accident. On the main roads there are zebra crossings but you need quite a lot of nerve to use them. Our guide obviously was convinced of the power of Allah as he strode across beckoning to us. We gingerly went forth whilst the traffic screeched to a halt, then weaved around us very skillfully. 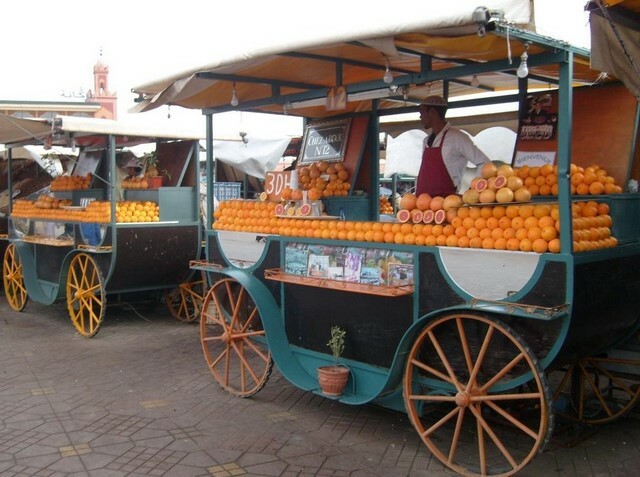 The square itself contains many stalls, the most common selling cold, freshly crushed orange juice at around 18p a glass. 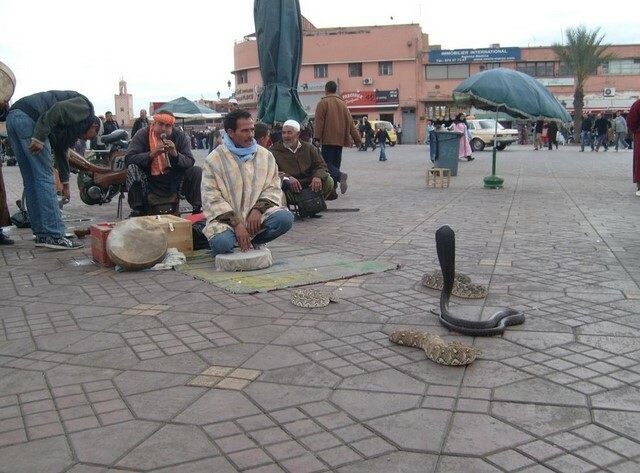 There was the occasional snake charmer but generally the sights nowhere near equalled those at a Cambridge Strawberry Fair ! 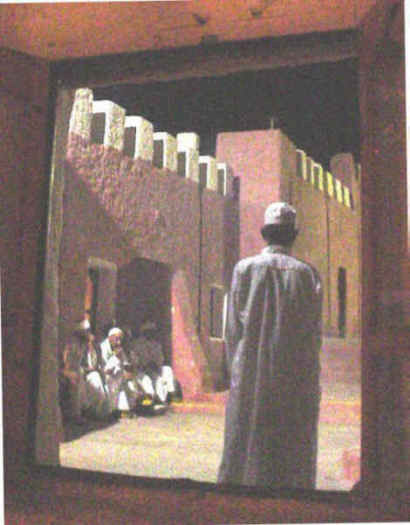 Most of the locals stand around in groups listening to the traditional story tellers. 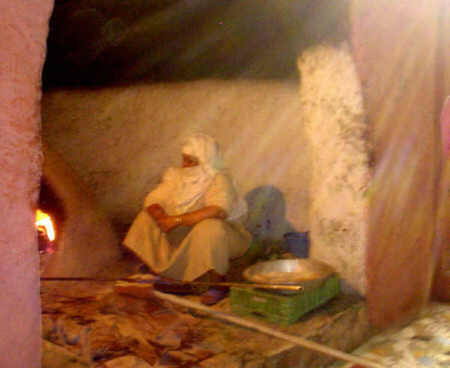 Many of the locals are of Berber origin and although they may speak Arabic and French their own Berber dialects are not written. So story telling is important. After dark, brightly lit food stalls set up in the centre serving up kebabs, fish, salads and soups and local dishes to the tourists and locals, sitting at long benches. The tour guide took us through the Souk and Medina. We were surprised that the rule regarding photography was that most people (apart from the colourful water sellers - below) objected to being photographed, though we were welcome to take pictures of the goods. But a tip is expected in most cases. These days the water sellers make much more from posing than they do from selling water. And it is NOT me in fancy dress ! The quality of most of the goods seemed high and the intricacy of the hand crafts was remarkable. There is little mass production. Men (mostly) sit on the floor bashing metal, welding, stitching leather goods, sewing or carving wood and stone. Inevitably the tour guide takes you to his favourite workshops, such as a carpet company or ‘Apothecare’, where you get a lengthy demonstration of the various medications and the guide hopes to get his commission if you buy. We sat outside a café on the Djemma El-Fna Square and had a couple of coffees, whilst the sun went down and the Muezzin called the faithful to prayer (though we didn’t see anyone go) and admired the skill of the moped riders as the weaved in and out between the crowds at incredible speed. We didn’t risk the food, just in case, but I feel sure it would have been fine. The freshly crushed orange juice can be recommended. In the darkened square everyone seemed relaxed and friendly. We had no dire warnings of pickpockets and, frankly, I don't think there were any; unlike some well known cities I could mention. We then visited the Jardin Majorelle which had been created by a French artist in 1920. It was very lush and full of exotic plants. 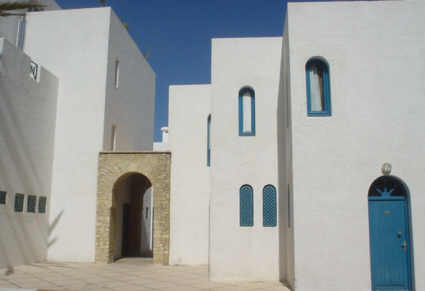 It also contains an impressive museum of Islamic art. I recommend Morocco (and Agadir in particular) as an exotic alternative to the Canary Islands, which boast a similar climate. Sunshine most of the year and only 3 - 4 hours from Gatwick. 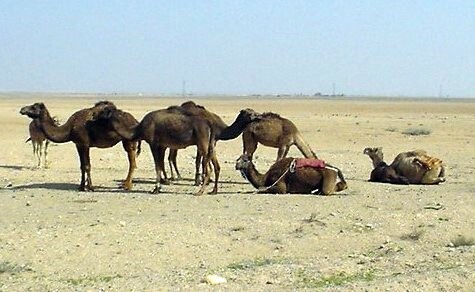 I gather they are planning cheap flights to Marrakesh from Stansted. Now that is worth thinking about! The skies are blue in Morocco for 300 days a year !